During important events like the stressful state testing period, kids need a couple reminders to just relax and take their time. 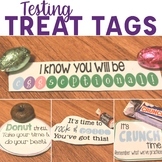 These treat tags compliment everyday grocery products to help you give your students a fun treat to encourage them. Give your students some motivation before standardized testing! Treats include:starbursts, mints, cookies, and blow pops. 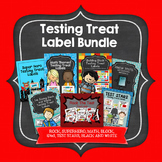 Testing Treat Label Bundle: Rock, Super Hero, Math, Ink Saving, and More! Looking for ideas to give kids during testing week? Here are six great ideas you can use. Just print each sheet and add the candy. Sayings are for blow pops, airheads, smarties, dum dums, nerds, and starburst. Great little sayings to help boost your students' confidence during testing. The labels read "Don't forget to Chex your answers!" and were attached to a snack sized bag of Chex Mix. Labels were created to be printed on standard business cards (10 per page). The label reads "It's crunch time! Crunch those numbers!" and was attached to a baggie of snack sized Crunch bars. These were created to be printed on standard business cards (10 per sheet). This set includes two labels. One for a Kiss and one for a Crunch Bar. They are color and just need to be printed and cut out! These labels are the perfect motivation for state testing. A little treat just to let the kids know that you want them to do their very best! This label can be used to put on a mini M&M's bag as a treat for testing week. It says: You are marvelous & magnificent. 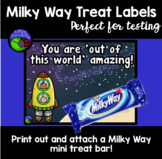 This label can be used to put on any Teddy Gram bag as a treat for testing week. It says: Do your beary best.